In discussions of special relativity, you occasionally encounter a claim like, “The effects of special relativity only matter to particle physicists and others working with extreme energies and velocities. Relativity has no consequences in everyday life.” Well, these days, anybody who relies upon the Global Positioning System (GPS) to navigate their car or the airliner in which they're travelling uses both special and general relativity, because without correction for their effects, GPS would be so inaccurate as to be useless. But GPS is a recent innovation, and the relativistic corrections are both complicated and hidden from the user in the software in the receiver and on board the satellites. But there's an effect of special relativity which was observed, if not understood, by the ancients: the yellow gleam of gold. increases the electron's mass (or, in more modern terminology, momentum) by about 20%. Quantum mechanics replaces the Bohr orbits with a probability distribution of the electron's position, with the Bohr orbit radius interpreted as the distance from the nucleus where the peak probability occurs. The relativistic increase in mass of the electron causes a relativistic contraction of its orbit because, as the electron's mass increases, the radius of an orbit with constant angular momentum shrinks proportionately. From the Bohr model, you might expect this effect to be significant only for the innermost electrons, but due to quantum mechanics, it strongly affects electrons in s orbitals even in outer shells, because their probability density remains high near the nucleus. The higher angular momentum p, d, f, and g orbitals have their probability peaks farther from the nucleus, and hence are less affected by relativistic contraction. The colour of metals such as silver and gold is mainly due to absorption of light when a d electron jumps to an s orbital. For silver, the 4d→5s transition has an energy corresponding to ultraviolet light, so frequencies in the visible band are not absorbed. With all visible frequencies reflected equally, silver has no colour of its own; it's silvery. In gold, however, relativistic contraction of the s orbitals causes their energy levels to shift closer to those of the d orbitals (which are less affected by relativity). This, in turn, shifts the light absorption (primarily due to the 5d→6s transition) from the ultraviolet down into the lower energy and frequency blue visual range. A substance which absorbs blue light will reflect the rest of the spectrum: the reds and greens which, combined, result in the yellowish hue we call golden. 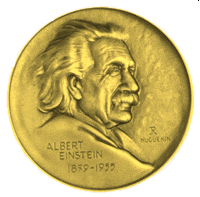 Special relativity is also responsible for gold's resistance to tarnishing and other chemical reactions. Chemistry is mostly concerned with the electrons in the outermost orbitals. With a single 6s electron, you might expect gold to be highly reactive; after all, cæsium has the same 6s1 outer shell, and it is the most alkaline of natural elements: it explodes if dropped in water, and even reacts with ice. Gold's 6s orbital, however, is relativistically contracted toward the nucleus, and its electron has a high probability to be among the electrons of the filled inner shells. This, along with the stronger electrostatic attraction of the 79 protons in the nucleus, reduce the “atomic radius” of gold to 135 picometres compared to 260 picometres for cæsium with its 55 protons and electrons—the gold atom is almost 50% heavier, yet only a little over half the size of cæsium. Only the most reactive substances can tug gold's 6s1 electron out from where it's hiding among the others, and hence not only the colour of gold, but its immunity from tarnishing and corrosion are consequences of special relativity.